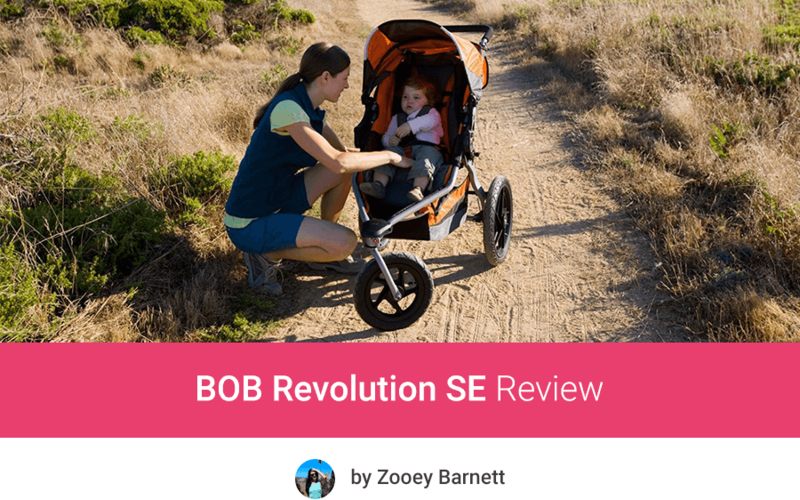 BOB Revolution SE Review - Why So Many Parents Love This Jogger? BOB Revolution SE is a great solution for parents who want to keep up their active lifestyle with their little baby. Thanks to this stylish and all-terrain stroller the child can accompany mommy and daddy during morning jogging, strolling along the beach and walking over old cobbled streets. 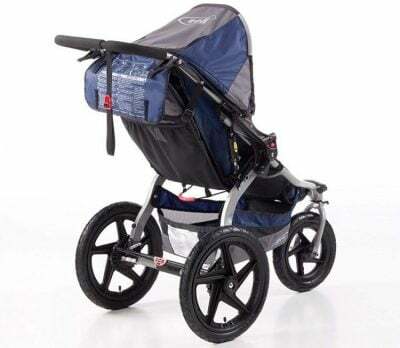 BOB Revolution SE is definitely one of the best single strollers for jogging. Its main advantages are: roomy and comfy seat with deep recline, excellent suspension that absorbs shocks and large wheels that handle the most rough terrain and huge extendable canopy. 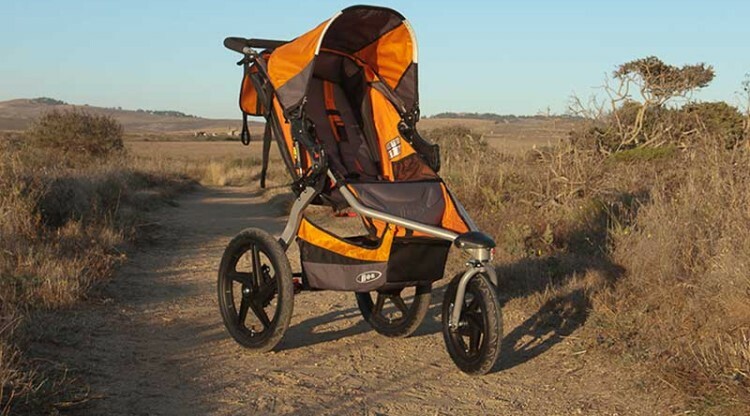 BOB SE stroller is designed for running on bumpy, uneven ground. It is perfect for light jogging on park paths and strolling over cracked pavement as well. It is a true off-road stroller. BOB Revolution SE will provide you and your little passenger with comfortable ride on all types of terrain. Are looking for high-quality and tested jogger? 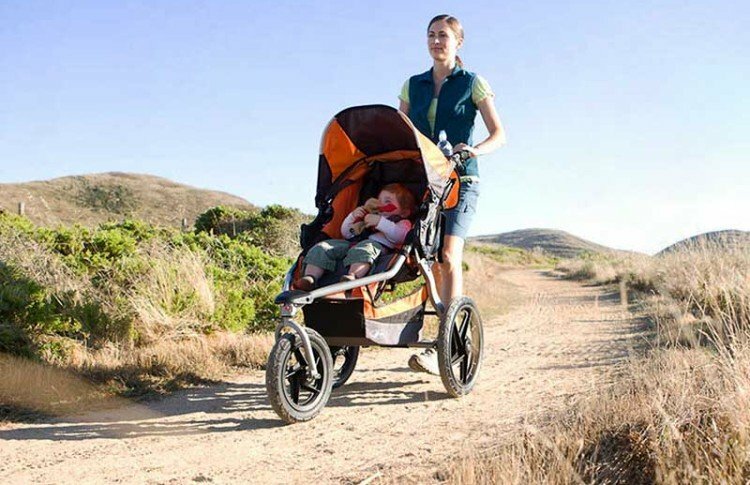 Here’s my full list of TOP jogging strollers for 2019. In this article I review BOB Revolution SE stroller. Keep in mind that there is also new upgraded version of this stroller – BOB Rambler Jogging Stroller which has few features changed. Click here if you want to check the Rambler model and learn more about differences between those two models. This BOB Revolution jogging stroller has many awesome functions that will satisfy many parents. There are a lot of advantages which make BOB Revolution SE heavy-duty jogger. This single BOB stroller has 3-wheel design, like other joggers from this brand. Front wheel is 12.5”, the rear ones are 16”. Thanks to such a big wheels with air-filled tires you can push this stroller over harsh terrain – it won’t get stuck and your child won’t get bumped around. These polymer wheels are shock resistant. They will handle even sandy beach (but remember that sand combined with salt water can be damaging to the wheel bearings and other metal components). Moreover, large wheels give you greater distance between you and the stroller which is very comfortable for parents who, like my husband, are tall and have long legs. Air-filled tires mean they can be punctured which can be quite annoying. But even if you have a flat tire it is not very difficult to fix it. You just need to replace the inner tube or go to the nearest bike shop and they will do it for you. To keep the wheels in the best condition, remember about adding some air once in a while. To check and fill the tires you can use normal bike pump. Front wheel can be set in two positions: swivel for easier maneuverability or locked which gives the stroller more stability (which is crucial when you’re jogging or strolling on rough ground). But for narrow sidewalks and tight corners, where you need more agility, the front wheel should be pivoting. Thanks to it BOB SE stroller can do a 360° turn in a very tight space! Perfect suspension system provides little passenger with smooth ride on any kind of terrain. This stroller will work on bumpy grass, sandy beaches, park paths, cement, asphalt, snow, gravel, old and broken sidewalks, roads with cracks, pot holes and bumps from tree roots. The suspension handles these conditions very well – of course you have to make sure you have locked the front wheel for better stability and traction and adjusted the suspension system to your child’s weight and terrain difficulty. BOB SE stroller is easy to steer and navigate, you can do it almost with one finger and you won’t feel it weight. This is very important, because runners want to get tired of running, not pushing! Besides, it has good shock absorbers that make riding very smooth even on gravel! My daughter often knocked out after first mile of our ride. For jogging on wooded trails or hilly roads in the forest I prefer BOB Revolution PRO though. Thanks to BOB’s amazing suspension system you don’t have to worry that your jogging will have negative impact on your baby’s spine. 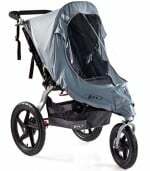 BOB Revolution SE has big extendable canopy, great for protecting your child from rain, wind and sun. My Haley was very sensitive to the sun when she was little so this feature was very important when I was searching for the right stroller. This canopy has five positions and can provide 125° range of coverage. It goes down pretty far, but not all the way down. Nevertheless, this will give your baby lot of shielding. BOB SE sunshade is equipped with big peek-a-boo window so you can keep an eye on you little passenger. Unfortunately the window closes with Velcro which for me is a drawback because it’s quite noisy. Magnetic closure would be definitely better solution. 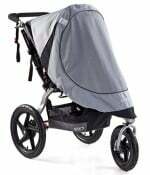 This BOB Revolution jogging stroller has very comfy seat with adjustable back rest for increased riding comfort. It doesn’t recline completely flat, but the angle is enough for comfortable nap (keep in mind that jogging with fully reclined seat is not safe, you should use it only during strolls). To recline the seat you just need to use two straps placed on each side which you have to adjust separately. I wish the recline mechanism was simpler and one-handed. The seat is 14.5” wide and 23” high (from the top of the canopy to the bottom of the seat). I must admit the seat back is pretty short. It was not an issue for me, because I used this stroller only for couple months when my Haley was 7-11 month old. But I heard that some moms had problems like that when their 3.5-year-old kids were already too tall for this stroller and could ride only with folded canopy (read more in customer reviews on Amazon). The material on the seat is easy to wash, but should be cleaned with regular sponge and water with mild soap, since it’s not machine washable and you shouldn’t wash it with detergent. Softly padded safety belts will protect your baby from falling out and sliding down. They are adjustable so you can set them properly to fit your growing baby. Release button is placed in the middle and it’s easy to use for parents. This brake is located between rear wheels and locks both of them in place. It can be a bit difficult to operate while wearing flip-flops. 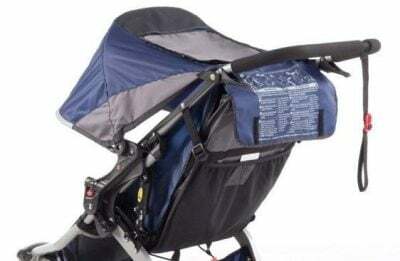 There is no handbrake, so if you are running downhill, you may have less ability to stop this stroller only with the safety strap when it starts running away from you. For me it is the main reason I prefer BOB Revolution PRO for running downhill. I would say BOB Revolution SE is awesome for rough terrain, but not for hilly area. This model is equipped with a safety wrist strap which is attached to the handlebar. It will give you and your baby extra security is case the pushchair starts to run away from you during strolling or jogging. The handlebar has really nice soft padding which makes the grip comfortable to hold. However, it is unadjustable. The handlebar is located 40” from the ground and its height can’t be change. Adjustable handlebar is very nice feature for parents of different height. I’m quite short and for me this handlebar was good, but my husband who is a foot taller than me (he’s 6’2”) found the handlebar little inconvenient. It was fine for light walking but pretty awkward to push for a long time. This was especially inconvenient with the safety strap being quite short. I would say this stroller is most comfortable to push for average in height parents, but may be less convenient for very short or very tall person. This single BOB stroller has a basket below the seat for baby gear and parents essentials.It’s very capacious and easy to access. There are two additional pockets inside the seat (for sippy cup or some snacks) and one big pocket on the back of the seat where parents can keep their valuables at hand. The producent says this stroller can be used since your baby is 8 weeks old and can accommodate up to 70 lbs. I would rather say the main seat is suitable for a child who can sit unassisted and you start jogging when your baby is about 6-8 months old. However you can use BOB SE stroller from birth, because it’s compatible with many infant car seats. This model can also be turn into a travel system – you just need proper car seat adapters. Click here to skip to Amazon to learn more about car seat compatibility and see available adapters. Keep in mind that if you use this stroller with infant car seat it’s only suitable for strolling, not running. It may be great option for getting back into shape after pregnancy. BOB Revolution SE stroller fold fairly easily in two-step process. You have to use both hands to fold the stroller. It is pretty easy, but usually moms don’t have both hands free. 😉 There is no automatic lock and the stroller doesn’t stand on its own after folding which many parents complain about. The dimensions of the folded stroller are: 39” x 25.5” x 16”. It’s good that you can take off the rear wheels to make the stroller a little bit more compact and fit it in most of the car trunks. 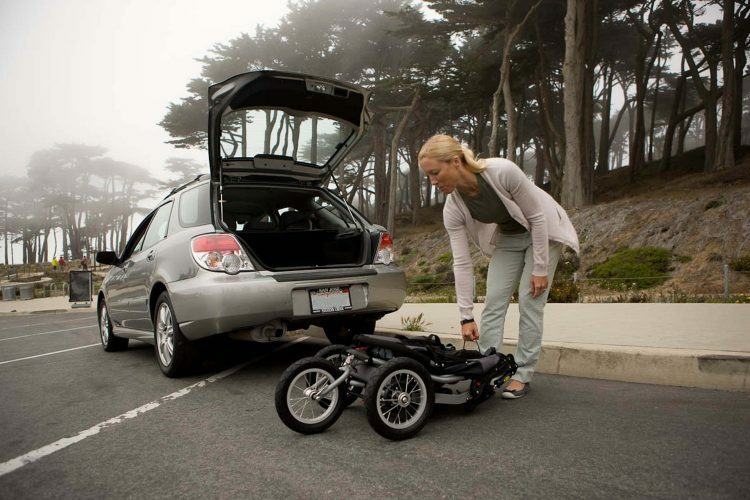 It still takes up a decent amount of space, so if you have a small car and for example would like to take this stroller for road trips, you might have problems with fitting all of your stuff in the trunk. BOB Revolution SE has lightweight frame which makes storage and transport more convenient. It weighs 25 lbs which is not that much for a jogger. It is 5.5 lbs lighter than BOB Revolution PRO 2016 and 3.5 lbs lighter than BOB Revolution FLEX. Still, it may be quite heavy to carry up and down the stairs and frequent loading into the car trunk may be annoying. BOB Revolution SE is available in three color versions: Black, Navy and Orange. The availability and price of this stroller may be a bit different, depending on the color you choose. If you want to check which colors are currently available and compare their prices, you can do it on Amazon – seller officially recommended by BOB. Here you can watch a wideo with BOB Revolution SE review! It is a previous version, but very similar to the newest model. There are many great accessories compatible with BOB Revolution SE stroller, but unfortunately they’re not included in the set. You need to purchase them separately. To increase the comfort of using this stroller you may want to consider buying especially a child tray and a parent console. BOB 2016 Single Infant Car Seat Adapter for Britax & BOB – It will let you turn the jogger into the travel system. Here is the adapter for Britax & BOB, but there are also adapters for few other brands, so be sure you are buying the one compatible with your car sear. BOB Single Snack Tray – I’m surprised this is not included in the stroller price. It is very useful accessory, especially if you’re planning long outdoor workouts or long-distance strolls. This snack tray is compatible with many BOB models: SE, CE, Sport Utility and Stroller Strides. Bob Stroller Handlebar Console with Tire Pump – This is another thing you need to buy separately because it doesn’t come with the stroller. It is equipped with two cup/bottle holders and a pocket between them. It is essential accessory, because it’s the only convenient and safe place for your bottle of water – you need to have it within reach when you’re running right? 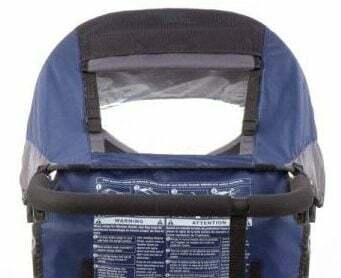 BOB Sun Shield – It is designed to protect your baby from sun or flying insects. It gives baby extra shade which is very useful if the baby is sensitive to the sun. BOB Weather Shield for Single Revolution – It will protect your baby from the rain and wind. The shield has a large window which is water resistant and let you keep an eye on your little one. I remember that few times during jogging with my baby it started to rain heavily but I kept the weather shield in the basket below the seat, just in case. It was very useful and easy to install. BOB Revolution SE has limited five-year warranty for the frame and limited one-year warranty for other components and fabric. Be careful to buy this stroller only from trusted, official seller recommended by BOB. This way you can be sure you get the original product (scroll down to the end of this article to find out more). I checked this stroller on Amazon to find out what parents have wrote about it and if it’s worth the money. 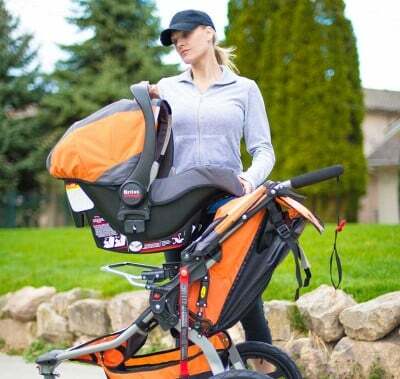 It turned out it’s extremely popular jogging stroller. It had few hundreds positive reviews, at the moment of writing this review (check the exact number right now). It’s incredible result. What parents love about this stroller and what they complain about? 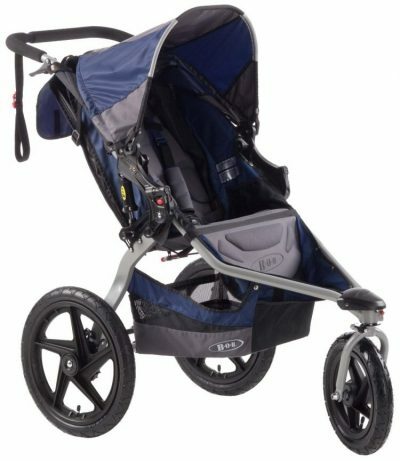 According to many parents this stroller is convenient for long-distance runs, some parents use it even for training to marathon. It’s works great for daily walks and trips to the beach as well. Another advantages are: great maneuverability and easy turning – it pushes like a breeze. Large canopy blocks the sun and wind very well. Many parents praise this stroller for the ability to use it from birth with an infant car seat. However, some parents complain about it’s durability – especially if this jogger is used for serious running on bumpy terrain. Few customers also mention they need to inflate the tires often, which is a bit annoying. Also, fold is not very compact. Another drawback is the most upright position – it is not fully up. 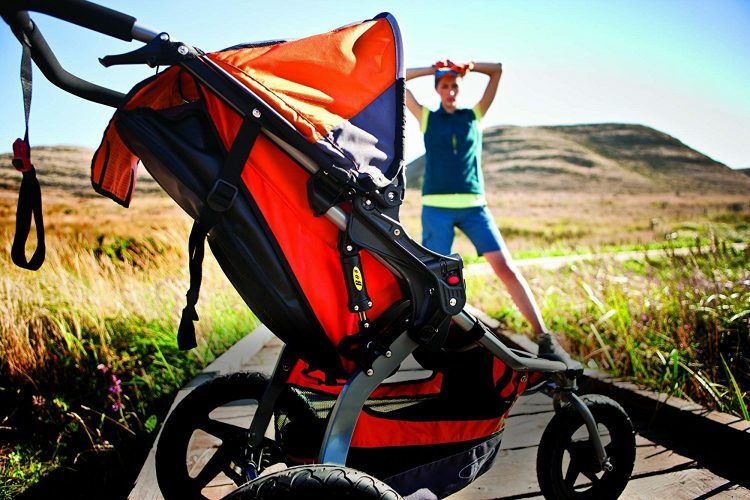 This single BOB stroller is good for jogging and every day use. Many parents use it not only for outdoor workouts and training, but also for running errands and daily walks around the city. The accessories for BOB Revolution SE stroller are sold separately. When you consider how expensive is this jogger, it’s ridiculous that you have to pay extra for parent console or child tray. When you add the price of accessories to the stroller price you realize you need to spend quite a lot of money! 1. 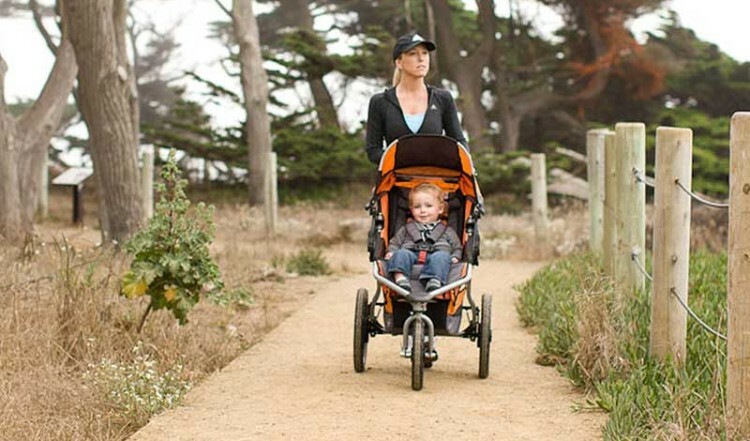 This jogging stroller is perfect for beginners and more advanced runners. And since it’s not excessively heavy you can use it for daily errands as well. 2. It absorbs shocks and really cushions the ride, so you can use it even on dirt and unbeaten roads easily. It’s also great choice for parents who live in rural area. 3. Thanks to long canopy you can enjoy strolling and jogging on summer days while you’re child is well protected from the sun rays. Do you like this stroller and think about purchasing it? Make sure to check available discounts on Amazon – seller recommended on BOB’s website. If this stroller doesn’t meet your needs, check out my ranking of the best strollers that you can currently find on the market.